This book fits a little in with the old timey children’s books I’ve been reading lately (Little House books, Me and My Little Brain). Whereas those books were set in the late nineteenth century, this book was written by a woman born in the late nineteenth century. As she gets older, in the early 1970s, she decides to buy a donkey and cart so she can travel around her neck of the English countryside. So her riding in the donkey trap gives her a lot of time to reflect on life and her youth. She worked for a while as a maid in a couple of houses in her younger days before marrying, so she reflects on those duties as well as her father, who drove a horse-driven delivery van. Missing from the reflections: married life or children, although she does talk about her daughter who lives on the property in the big house (where the author lives in a mother-in-law cottage). She talks about all the animals they have, including numerous cats, goats, and a rabbit. She name-checks an awful lot of flowers and foilage on the way to creating a textual landscape which doesn’t make that much sense to me because I don’t know my English flowers that much. It’s structured a bit like the Little House books in that it covers the first year she had the donkey, from her birthday in January to a nice little Christmas story. Still, it’s a pleasant little book. 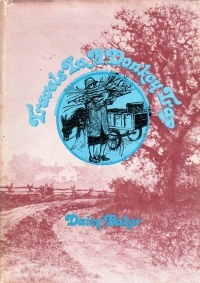 Apparently, she received some notice on the news back in the day for using the donkey cart, and she turned that exposure into this book. Which made it to an American imprint, too, so clearly back in the old days, the midlists were a thing. Question: The English call whiskey “whisky,” so why don’t the call a donkey “donky”? Previous Previous post: How Many Of These Six Items Do You Store In Your Garage? Next Next post: Is That The Look You Want?